Todd Archer, DVM, MS, DACVIM, is an associate professor of small animal internal medicine at Mississippi State University, where he also earned his DVM and master’s degree and completed an internship and residency in small animal internal medicine. Dr. Archer’s clinical interests include hematology, immunology, and endocrinology. Alyssa Sullivant, DVM, MS, DACVIM, is a faculty member in the small animal internal medicine department at Mississippi State University, where she earned her DVM and completed a specialty internship in internal medicine and oncology and a residency in small animal internal medicine. Her clinical interests include gastroenterology and oncology. The spleen is a complex organ composed of 2 distinct parenchymal areas (red pulp and white pulp), each with important hematologic and immunologic functions. The red pulp filters blood and removes senescent or damaged blood cells, aids in the metabolism and subsequent recycling of iron, and serves as a site for hematopoiesis, producing leukocytes, platelets, and RBCs when demand is increased. Regions of white pulp consist of lymphoid tissue that produces and stores immune cells (eg, lymphocytes, macrophages), which provide immune surveillance of blood for “foreign” material (eg, cells harboring infectious organisms, antibody-coated cells that are targeted for destruction and removal from circulation). The spleen also acts as a reservoir of blood, storing up to 20% of the total RBC mass and up to 30% of the platelet mass in the body. The spleen releases RBCs and platelets readily to meet physiologic demand. Splenic disorders are common in middle-aged and older dogs, with clinical signs ranging from vague signs of illness to life-threatening hemoabdomen. In these disorders, splenomegaly is often present, regardless of disease severity. Splenomegaly is typically caused by discrete nodule(s) or diffuse enlargement.1 Although splenomegaly can be present in the absence of clinical signs, patients with chronic splenic disease may exhibit lethargy, inappetence, vomiting, abdominal enlargement, and weight loss. Patients presented with hemoabdomen are often collapsed and in hypovolemic shock. Arrhythmias are common with splenic diseases, especially hemangiosarcoma.2 Splenomegaly may be detected on abdominal palpation or through imaging modalities such as radiography, ultrasonography, or advanced imaging. Imaging is useful for differentiating a splenic mass from diffuse splenomegaly and is important in narrowing the possible causes of splenomegaly. Following are the authors’ top 5 causes of splenomegaly seen most often in veterinary practice. Hemangiosarcoma is the most common malignant disease of the spleen, representing one-half to two-thirds of all malignant splenic tumors. It is more prevalent in older medium- and large-breed dogs (eg, German shepherd dogs, golden retrievers, Labrador retrievers, standard poodles).2,8 Hemangiosarcoma arises from the vascular endothelium and often develops into a large cavitary mass in the spleen (Figure 1). 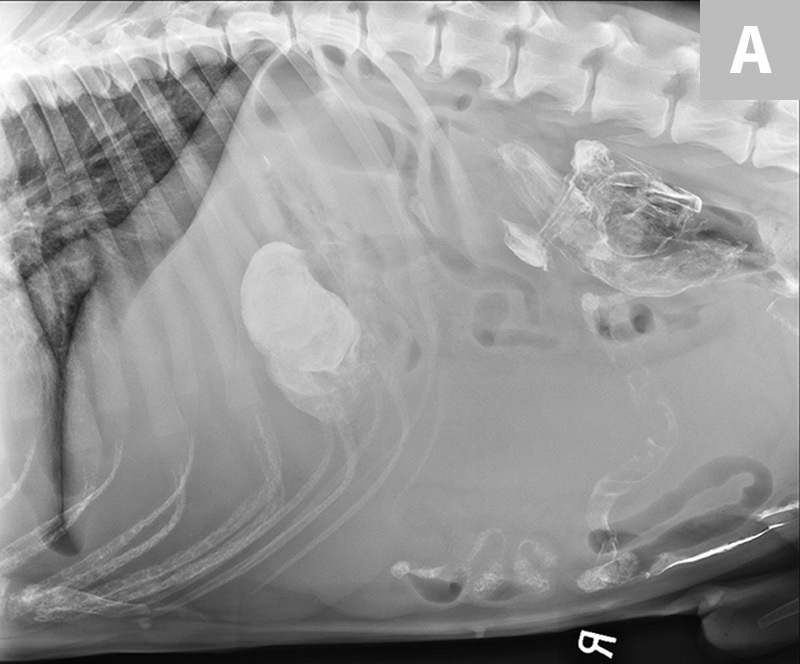 Approximately 25% of dogs with splenic hemangiosarcoma may have concurrent hemangiosarcoma affecting the right side of the heart.9 Clinical signs are typically related to anemia, which may be mild to severe and life-threatening, and include pale mucous membranes, tachycardia, lethargy, and abdominal distention.8 Intra- and extrasplenic hemorrhage may occur and can cause marked hemoabdomen and acute anemia with subsequent hypovolemia and collapse. Although hematomas and, less commonly, other benign splenic lesions may cause hemoabdomen, hemangiosarcomas are more likely to cause hemoabdomen.8 Blood study findings can include schistocytosis, thrombocytopenia, and, possibly, disseminated intravascular coagulation. FIGURE 1 Hemangiosarcomas are the most common splenic malignancy in dogs.3 Lesions are often cavitary, and hemoabdomen is common. Extramedullary hematopoiesis (EMH; ie, hematopoiesis occurring outside the bone marrow) causes diffuse uniform symmetric enlargement of the spleen (because of “work hypertrophy”) with increased activity of the mononuclear phagocytic system and increased blood cell production.10 Hypoxia is the main stimulus for splenic EMH in an adult animal11 and can be seen with any disease that undermines the ability of the bone marrow to function properly. 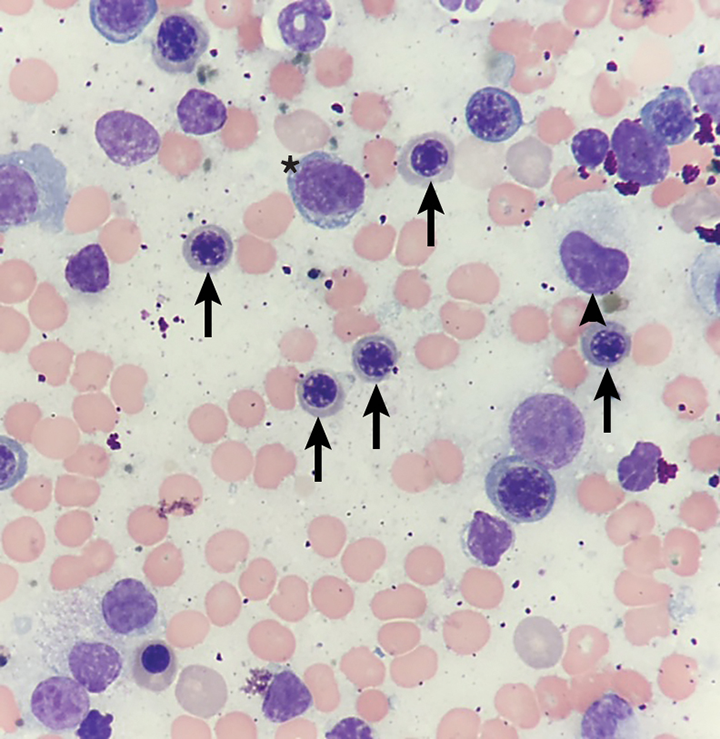 FIGURE 2 Erythroid (arrow) and myeloid (arrowhead) precursors are common cytologic findings in splenic extramedullary hematopoiesis, particularly in response to anemia.11 Lymphocytes (asterisk) are also commonly seen. FIGURE 3 Numerous, variably sized, sharply defined, hypoechoic nodules with a “honeycomb-like” appearance are characteristic of splenic lymphoma. 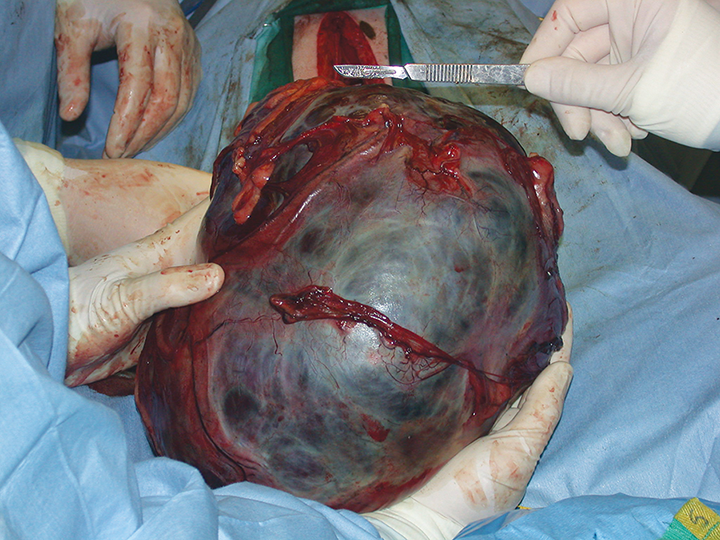 FIGURE 4 Splenic hematomas are the most common benign splenic mass. They may be quite large and are grossly indistinguishable from hemangiosarcoma. Splenic congestion has numerous causes, including sedation, anesthesia, thrombosis, right-sided congestive heart failure, splenic torsion, and portal hypertension. Splenic congestion may cause severe splenomegaly and clinical signs, as the spleen is capable of pooling up to 30% of blood volume.10 Smooth muscle relaxation may be responsible for drug-induced splenic congestion, which is transient and may be limited to certain drugs (eg, phenothiazine sedatives, ultrashort-acting barbiturates).17 Administration of acepromazine, thiopental, or propofol produces marked splenomegaly.18 Severe hepatic disease may lead to portal hypertension and subsequent splenomegaly. Increased systemic hydrostatic pressure from right-sided congestive heart failure or increased splenic vein hydrostatic pressure because of thrombosis may cause splenic congestion. FIGURE 5 Splenic torsion appears as a large soft-tissue opacity that displaces the GI tract caudally and peripherally (A). The splenic head is obscured caudal to the left margin of the stomach (B). The metallic opacity seen in the stomach and intestines is caused by recent barium administration. Day MJ, Lucke VM, Pearson H. A review of pathological diagnoses made from 87 canine splenic biopsies. J Small Anim Pract. 1995;36(10):426-433. Sherwood JM, Haynes AM, Klocke E, et al. Occurrence and clinicopathologic features of splenic neoplasia based on body weight: 325 dogs (2003-2013). J Am Anim Hosp Assoc. 2016;52(4): 220-226. Spangler WL, Culbertson MR. Prevalence, type, and importance of splenic diseases in dogs: 1,480 cases (1985-1989). J Am Vet Med Assoc. 1992;200(6):829-834. 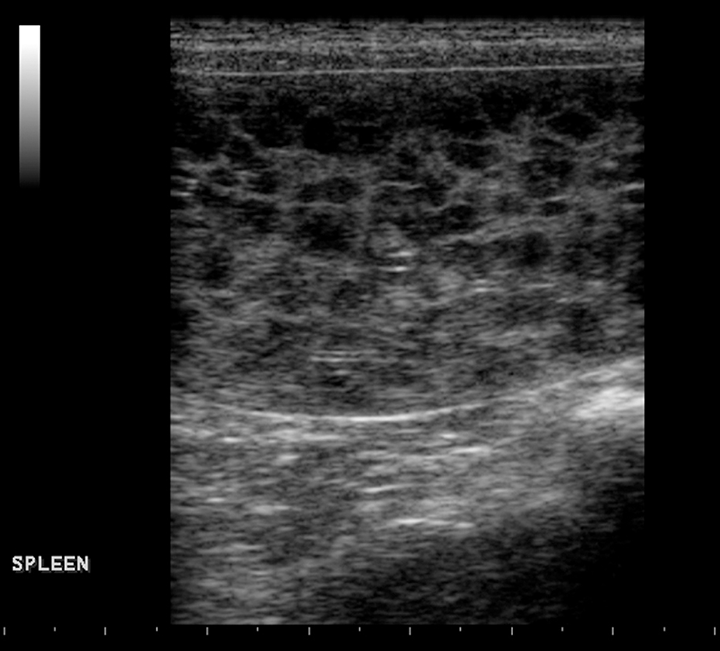 Cleveland MJ, Casale S. Incidence of malignancy and outcomes for dogs undergoing splenectomy for incidentally detected nonruptured splenic nodules or masses: 105 cases (2009-2013). J Am Vet Med Assoc. 2016;248(11):1267-1273. O’Keefe DA, Couto CG. Fine-needle aspiration of the spleen as an aid in the diagnosis of splenomegaly. J Vet Intern Med. 1987;1(3):102-109. Ballegeer EA, Forrest LJ, Dickinson RM, Schutten MM, Delaney FA, Young KM. Correlation of ultrasonographic appearance of lesions and cytologic and histologic diagnoses in splenic aspirates from dogs and cats: 32 cases (2002-2005). J Am Vet Med Assoc. 2007;230(5):690-696. Christensen N, Canfield P, Martin P, Krockenberger M, Spielman D, Bosward K. Cytopathological and histopathological diagnosis of canine splenic disorders. Aust Vet J. 2009;87(5):175-181. Hammond TN, Pesillo-Crosby SA. Prevalence of hemangiosarcoma in anemic dogs with a splenic mass and hemoperitoneum requiring a transfusion: 71 cases (2003-2005). J Am Vet Med Assoc. 2008;232(4): 553-558. Waters DJ, Caywood DD, Hayden DW, Klausner JS. 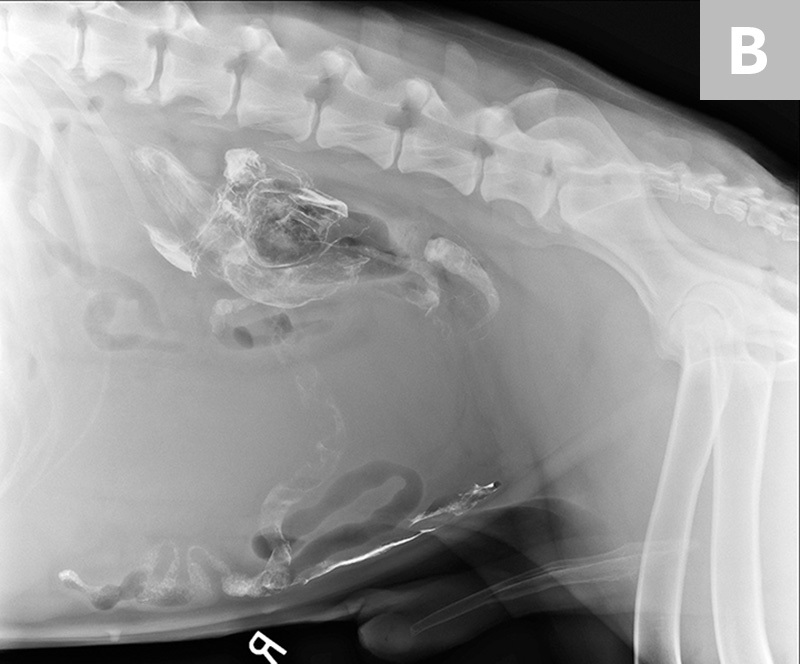 Metastatic pattern in dogs with splenic hemangiosarcoma: clinical implications. J Small Anim Pract. 1988;29(12):805-814. Argyle DJ, O’Brien RT. Nonneoplastic diseases of the spleen. In: Ettinger SJ, Feldman EC, Côté E, eds. Textbook of Veterinary Internal Medicine Expert Consult. 8th ed. St. Louis, MO: Saunders; 2017:877-887. Christopher MM. Cytology of the spleen. Vet Clin North Am Small Anim Pract. 2003;33(1):135-152. Vail DM, Young KM. Hematopoietic tumors. In: Withrow SJ, Vail DM, eds. Withrow & MacEwen’s Small Animal Clinical Oncology. 4th ed. Ames, IA: Saunders; 2007:699-717. Crabtree AC, Spangler E, Beard D, Smith A. Diagnostic accuracy of gray-scale ultrasonography for the detection of hepatic and splenic lymphoma in dogs. Vet Radiol Ultrasound. 2010;51(6):661-664. Nyland TG, Mattoon JS, Herrgesell ER. Spleen. In: Mattoon JS, Nyland TG, eds. Atlas of Small Animal Diagnostic Ultrasound. 3rd ed. Ames, IA: Saunders; 2015:136. Lee A. Personal communication. Mississippi State University College of Veterinary Medicine Radiology Department. Patten SG, Boston SE, Monteith GJ. Outcome and prognostic factors for dogs with a histological diagnosis of splenic hematoma following splenectomy: 35 cases (2001-2013). Can Vet J. 2016:57(8):842-846. O’Brien RT, Waller KR III, Osgood TL. Sonographic features of drug-induced splenic congestion. Vet Radiol Ultrasound. 2004;45(3):225-227. Baldo CF, Garcia-Pereira FL, Nelson NC, Hauptman JG, Shih AC. 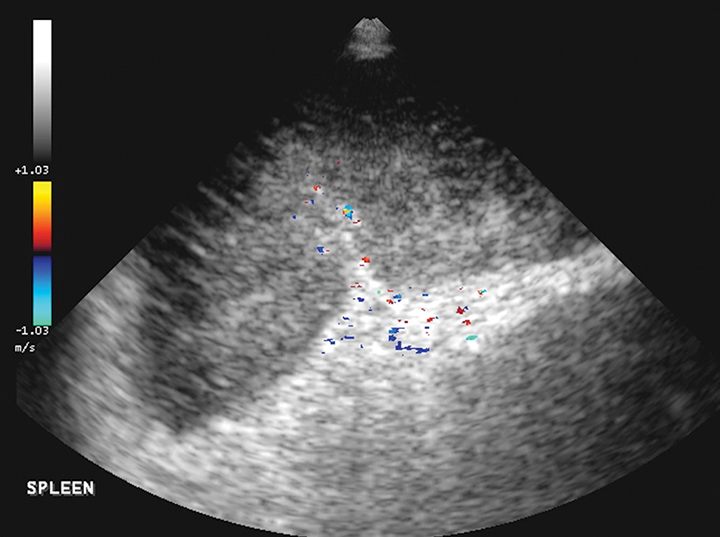 Effects of anesthetic drugs on canine splenic volume determined via computed tomography. Am J Vet Res. 2012;73(11):1715-1719. DeGroot W, Giuffrida MA, Rubin J, et al. 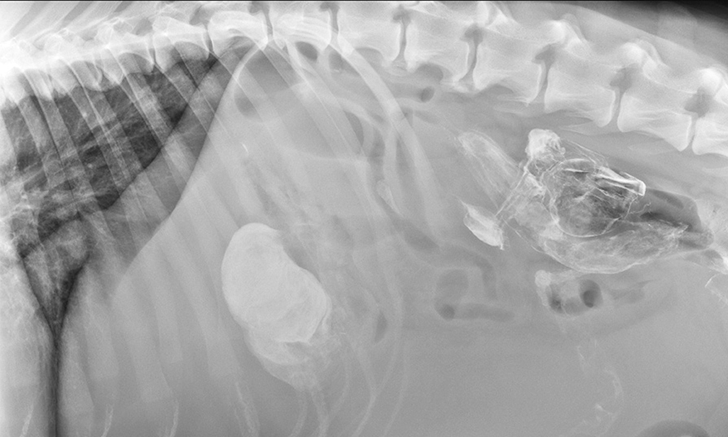 Primary splenic torsion in dogs: 102 cases (1992-2014). J Am Vet Med Assoc. 2016;248(6):661-668. Mai W. The hilar perivenous hyperechoic triangle as a sign of acute splenic torsion in dogs. Vet Radiol Ultrasound. 2006;47(5):487-491.